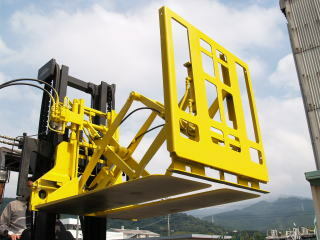 The Load Push-Pull is a device for handling cargos with sheet pallets.The gripper at the lower edge of the face plate grabs the loaded sheet pallet,and the load is carried by pulling the cargo with the pantograph mechanism while sliding it across the upper surface of the platen. When unloading the cargo together with the sheet, the cargo is pushed out with the front surface of the face plate, in the reverse operation. To push out the cargo only, the tab of the sheet pallet is grabbed again with the sheet retainer and only the cargo is pushed out by the face plate. The Load Push-Pull is a device for handling cargos with sheet pallets.The gripper at the lower edge of the face plate grabs the loaded sheet pallet, and the load is carried by pulling the cargo with the pantograph mechanism while sliding it across the upper surface of the platen. When unloading the cargo together with the sheet, the cargo is pushed out with the front surface of the face plate, in the reverse operation. To push out the cargo only, the tab of the sheet pallet is grabbed again with the sheet retainer and only the cargo is pushed out by the face plate.